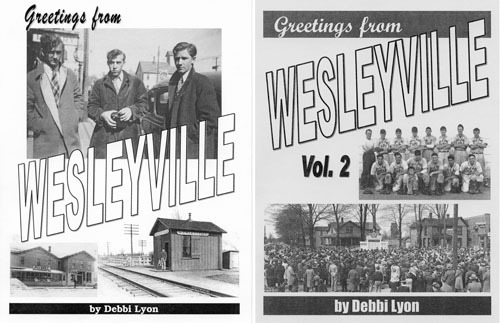 Greetings from Wesleyville follows pioneer families and daily life in this Erie County, PA town from the 1820s to 2005 and “describes the importance of individual citizens in creating a community.” Includes old photos, maps and advertisements. Fully indexed. 484 pages, comb binding (2007). $35 Back in stock! Printed books are available in limited quantities from the author. Contact Debbi Lyon via e-mail at Dlyontamer@gmail.com to inquire about prices. I also have a very limited quantity left of the Old Time Erie 2014 Calendar. E-mail me for info. I still make ConeyIsland my first stop whenever I return to Erie. Remember when Gus died, a nice man, and his wife was great too. My family moved from Cleveland to Wesleyville in 1953 when I was two. I would escape the picket fenced yard and discover rusted treasures in the voids between garages, see my reflection in the chrome hubcaps of hotrods parked in front of the bars. My most unforgettable moment was when my sisters, brother and I ran screaming out of the Penn Theater when the Creature from the Black Lagoon leapt from the screen! We moved to Roger Young and eventually Harbor Homes. I joined the Navy and now live in Scotland. Wesleyville will always be in my heart.